Tomorrow I’m off to France to spend a week on the jury of the Lyon International Chamber Music Competition. This year the competition is for piano trio – the classic combination of piano, violin and cello. From time to time I come across people who think -very reasonably – that ‘a piano trio’ must consist of three pianos and three pianists, so I reckon it’s worth clarifying which instruments are involved in the traditional formulation known to Beethoven, Schubert, Brahms and co.
Nineteen trios from around the world have been admitted to the competition. I’m looking forward to hearing different styles of playing, as well as observing different modes of presentation from South East Asia and the USA as well as Europe. In recent years I’ve often felt that ‘the visual element’ of performance plays a bigger and bigger part in everyone’s consciousness. I’m not immune to it myself, naturally, but in fact when people start playing I often listen with eyes closed in order to focus on the purely musical result. In the UK I am still wearing woollen jumpers every day, with scarves and gloves for outdoors. 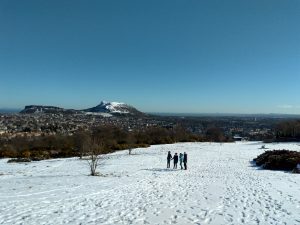 It’s only a few days, in fact, since we had our last batch of snow in Edinburgh (see photo). Luckily, as I started packing today, it occurred to me to look up the weather for Lyon. What a nice surprise! Temperatures are predicted to be in the high teens and even up to 20 degrees and beyond. Warm spring weather! Out of my suitcase came the jumpers, scarves and gloves. And then I looked up some pictures of the Lyon opera house, the music conservatoire, and the houseboat ‘La Plateforme’ moored in the Rhône in front of the Préfecture – all locations which are part of the competition at various stages. More pleasant surprises! Add to that the reputation of Lyon as a foodie destination and … I’m really starting to look forward to it all. This entry was posted on Sunday 8th April 2018 at 4:53pm	and is filed under Daily Life, Travel. You can leave a response, or trackback from your own site. Listening with eyes closed…yes! Just heard a neurologist mentioning the way that listening and thinking with closed eyes immediately allows extra parts of the brain to start operating. Not sure if it works to play the piano with closed eyes, but I certainly get much more ‘feedback’ when playing violin/viola from memory with closed eyes. That should be fun. I tend to think that the piano trio is the ‘highest form’ for chamber music. Perfect interplay is required and when it happens, magic happens. Recently I went on a journey of discovery through many recorded performances of the Brahms Op. 101 #3 in Cmin, ranging from Casals to a recent release by Trio Isimsiz (which prompted it) – via Rubinstein, Frankl, Borodin, Beaux Arts, Fontenay, Kallichstein, Gould and others. But I have to say that musically, my vote landed on the Florestan Trio. I thought you’d like to know. Keep up the blog and writings! Bob, thank you! I have been away and somehow missed seeing your comment until now. I am very touched to think that our Florestan recording of Brahms was your favourite. Your comment about the piano trio (‘highest form of chamber music’) is interesting. I recently talked to a promoter who felt the same way, but observed that the string quartet had developed much more of a ‘myth’ than the piano trio and has always had a higher public profile. I suppose it’s partly that the string quartet is so portable, needs no piano, and can play anywhere! So more people are likely to come across it. But it’s more than that too, I think.